Dennis Eckersley said it in the booth in the ninth inning - "They need this game." We all needed that one last night. The players...the fans...you could feel Fenway coming apart when Rafael Devers bounced a single into right field to drive in Eduardo Nunez with the winning run in Boston's 7-6 walk-off win over the Blue Jays Thursday night. Mitch Moreland (pictured) had a big night with a homer in the seventh and a game-tying double to deep center in the ninth to help the Red Sox come back from an early 5-0 deficit. Toronto had taken the lead on a pair of third-inning home runs off Boston starter Nathan Eovaldi who managed to gut his way through five innings. Boston chipped away with three in the bottom of the inning on RBI doubles by J.D. Martinez and Devers, and a run-scoring single by Dustin Pedroia. 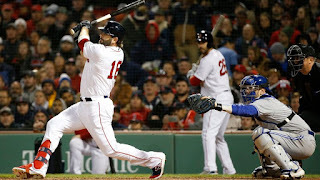 Moreland tied the game in the seventh with his fifth home run of the year and after the Blue Jays took the lead in the eighth, he tied the game again with the ninth-inning double, setting the stage for Devers to win it. Marcus Walden was the winner in relief.